Patteeswaram Durga Temple is located around 8 km from Kumbakonam and is dedicated to Goddess Durga. The main temple is dedicated to Shiva but is famous as Dhenupureeswarar Durga Temple. The temple is noted for its ornate rajagopuram. Goddess Durga worshipped here is Shanta Swarupi – peaceful form. The murti in the temple is seated on her vehicle lion and her foot rests on demon Mahishasura. She has eight hands and holds conch, discuss, bow, arrow, sword, shield and a parrot. One hand is in blessing posture. Goddess here is three-eyed. An unusual aspect in the murti is that lion on which she is seated is seen facing left side instead of right side. People having trouble with Rahu and Ketu worship Durga during Rahu Kalam to attain relief. The important dates of worship in the temple are Tuesday, Friday, Sunday, new moon day, full moon day, Ashtami and Navami. The main temple is known as Dhenupureeswarar Temple. The goddess is named Gnanambikai. 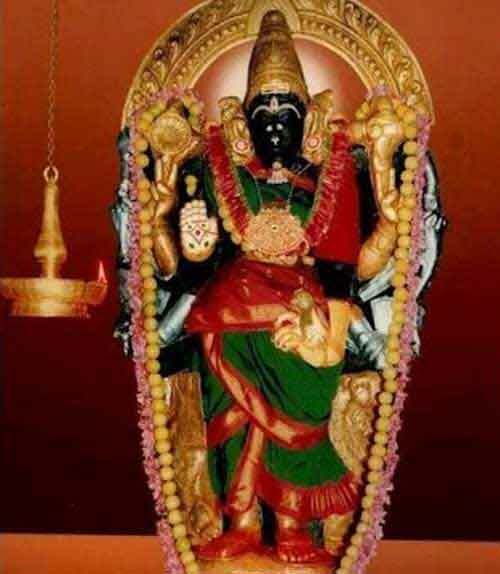 Legend has it that Mother Goddess Shakti wanted to perform austerities and chose Patteeswaram for it. Kamadhenu asked her daughter to assist Goddess Shakti in her tapas. As patti, calf of sacred cow, Kamadhenu appeared here the place got the name Patteeswaram. It is said that the calf installed a Shivling and worshipped here. Shiva pleased with her devotion appeared before her. Today the temple is more popular as a Durga Shrine. The temple is located on the Kumbakonam – Darasuram bus route.